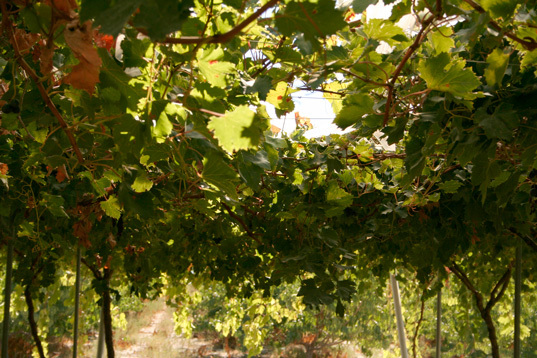 With more than 30 years of experience, in a privileged environment in Abarán for growing fruit and grape. Brothers Antonio and Jesus Caballero Palazón consolidated Frutas Torero with their effort and dedication, a dream come true. 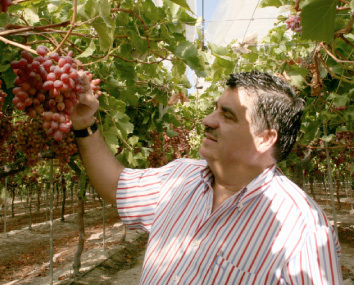 Our history begins at the end of the seventy’s, when two brothers, Antonio and Jesús Caballero Palazón, set up their own fruit export business at a time when this market was growing. 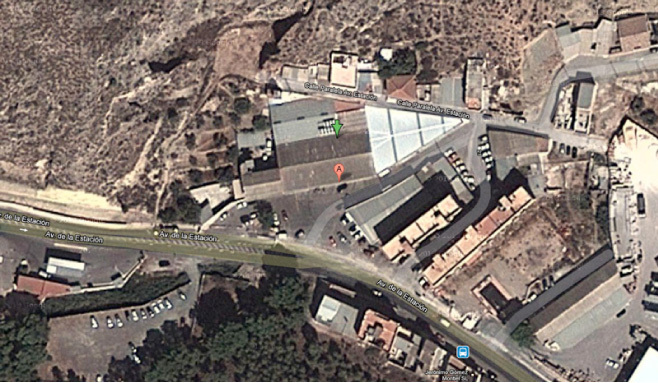 A rented warehouse in Blanca’s railway station was their starting point. During this time, the young Caballero Palazón brothers established commercial relations and begun the increasing curve of their business, as they gained experience to face new challenges in a short period of time. The fast growth of their business and the increasing number of employees forced them to move on to a bigger warehouse with better infrastructure and better location – Abaran’s city centre, specifically, in the town’s ring road, presently known as the Avenue of the Constitución.Sales kept on growing during the next three years; so much so, that they had to move once again to another warehouse, one that is now their current location – placed in Abaran’s town entrance, heading to Barranco Molax. A bigger warehouse was built, with modern technologies and facilities. In the next years, their business experiences a sustainable growth and commercial relations grew stronger in various countries: Germany, Italy, France, Austria and the United Kingdom. Thanks to Antonio Caballero and his sales representative, A. Gómez, Ltd, the United Kingdom became the main export destination. As a result, in 1995, Frutas Torero, S.A. was founded and it is now a worldwide known company in their own kind, due to the quality of its products and to its professionalism. FRUTAS TORERO has participated in the FAIR ASIA FRUIT LOGÍSTICA, Hong Kong, from September 3 to 9, 2017, organized by the Institute of Development of the Region of Murcia, and co-financed by the European Regional Development Fund (ERDF) and the Institute of Promotion of the Region of Murcia. 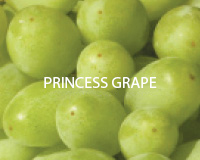 We guarantee our quality with the protocols BRC, GLOBALGAP, Field to Fork, Tesco Nurture and IFS, so that our fruit has an excellent taste. The British Retail Consortium’s (BRC) objective is to establish security, quality and operation post criteria that food producers must voluntary undertake in order to fulfil legal and consumer protection obligations. The implantation of a Hazard Analysis and Critical Control Points (HACCP), a guide that describes step by step how to manage food safety hazards. 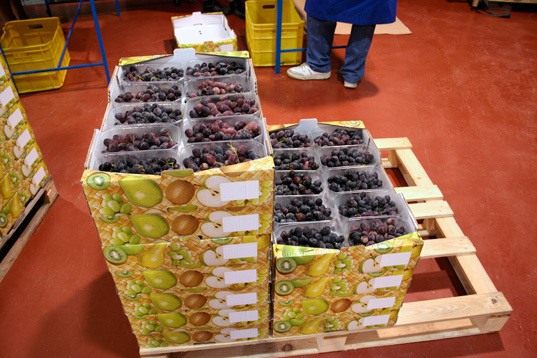 From Abaran’s orchard, which is watered by the Segura river, our fruit is exported to Europe and Russia. In Frutas Torero we know that the quality of the seed is what makes the difference of our fruit and that it will be crucial to make you enjoy it. 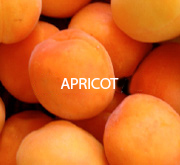 It is a fruit of the apricot tree. 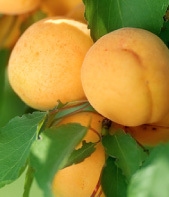 The apricot has a smooth stone and yellow meat. It is almost round and has a crease which is normally yellow and partly meaty. It has velvety skin, a nice taste and a smooth stone like bitter almond. The fruit is small; the tree has branches with no thorns, heart shape leaves and white flowers. It has a velvety skin and its meat is white or yellow. It is juicy and perfumed and has a stone. The peach’s season covers from the end of May until September. 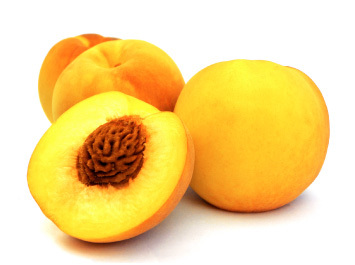 We can distinguish between white peaches (these are fragile, have a thin texture and are very perfumed), and the yellow peaches (more resistant and less juicy). 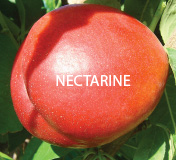 The nectarine is a variety of the peach that comes from recent mutation of the peach tree. It has reddish thin and smooth skin, which is the only difference from the peach, as they have the same nutritional values. 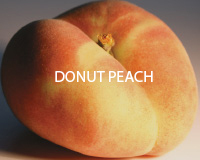 Donut peach is a variety of peach. 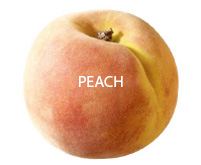 It comes from a mutation of the peach tree. It has the same nutritional properties as peach, but differs in its physical appearance by the lint of the skin, its crushed shape, the characteristic color when it is at its best, and its pulp, more fleshy and sweet. 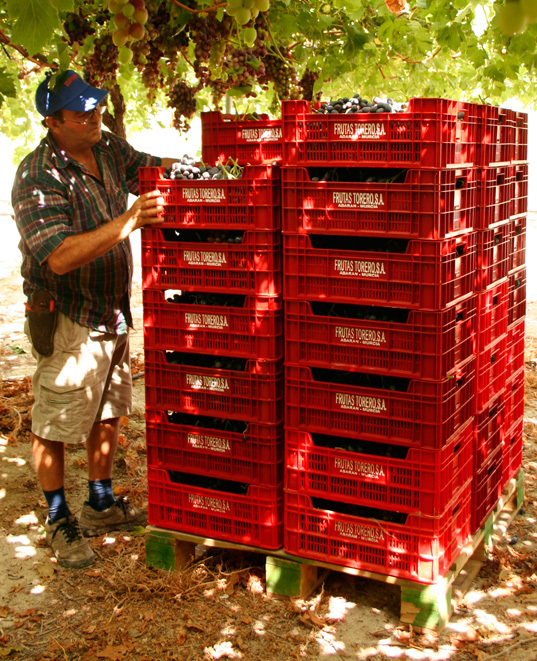 Medium sized bunches with a conical shape and medium to high compactness. Berries have a medium-high size with a long elliptic shape. They are crunchy, red coloured and with neutral taste. 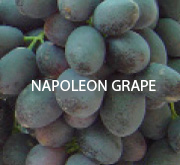 It is one of the most interesting grapes, as the bunch comes with a very attractive big and coloured berry. 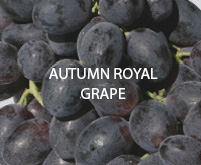 It is a new fragile and sweet grape that makes a delicious snack for autumn. It has a solid skin, and an oval shape. It is seedless and has the length of an inch. It has black or purple skin and white blooming. 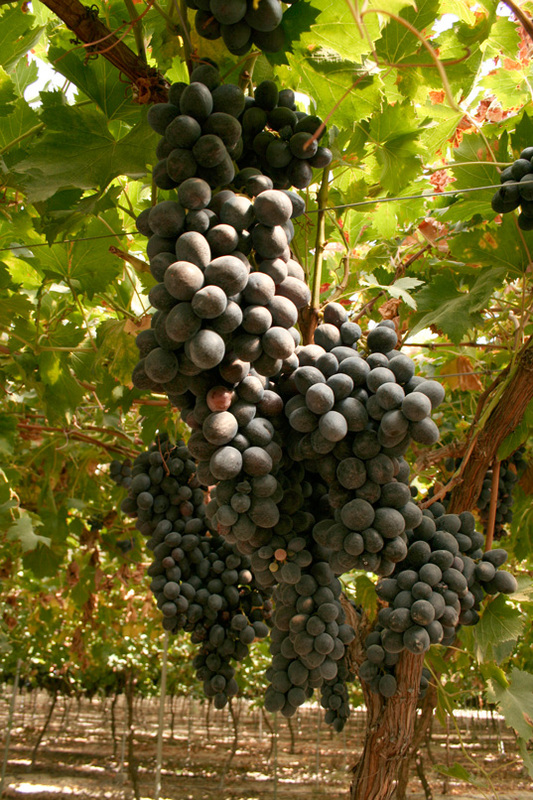 It is a big grape, with a solid skin and big seeds. It has a smooth and sweet taste. 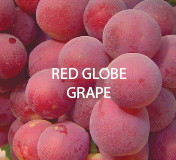 During its ripening process it has a ruby red colour. 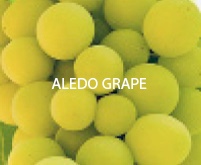 This grape is very popular in Europe. 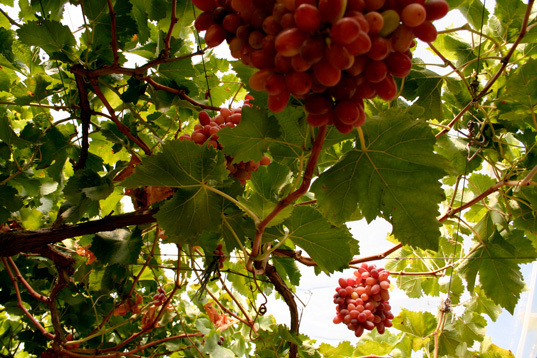 It is a firm variety, with very good postharvest behavior. Its harvest is late, has a sweet taste with some muscatel. 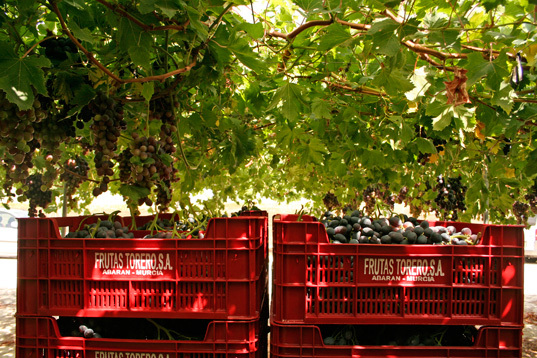 Traditional fruit from the Ricote Valley region. 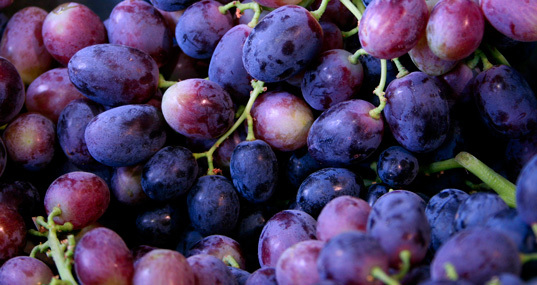 Purple in color and hard skin, has been the predominant grape in our region for a long time, especially consumed in eastern countries. 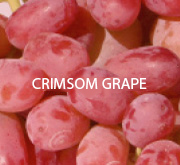 It is a tradition to have this grape during Christmas. It is pale white and has a neutral sweet taste.